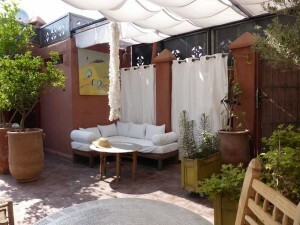 Dar Nour El Houda – an oasis in the heart of Marrakech! Experience the wonders of time-travel by visiting the well preserved thousand year old medina of Marrakech with its maze of narrow streets peppered with markets, mosques, madresas and museums. For the adventurous traveller it is an experience you will never forget and will wish to return to, being overwhelmed with colours, sights, sounds and smells. And the only way to really experience Marrakech is by staying within the medina itself in a riad (traditional Moroccan house with rooms around a courtyard). 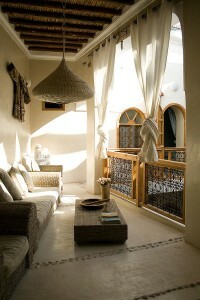 We would be happy to host you at Dar Nour El Houda, a British owned riad of the highest standards. 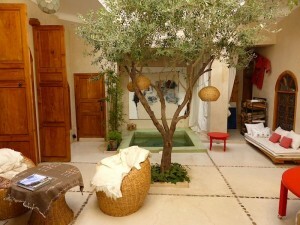 A real oasis with an olive tree in the middle of our courtyard and a roof terrace with relaxing areas that includes views to the Atlas Mountains. 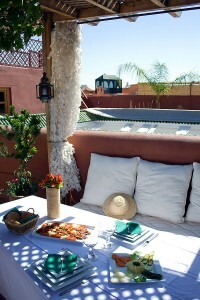 Our riad is five minutes walk to the famous Ben Youssef Mosque and Madresa. It is also a fifteen minute walk to the famous Jamaa El Fna square. We pride ourselves on our customer service as well as unbeatable value for a boutique quality riad rated 5 stars by Tripadvisor. Our prices range from £41 to £51 per room, but for a short time the new owners are offering a 20 percent discount for direct booking using the code DAR20PCENT (please note this offer cannot be combined with other offers). This means that rooms range from £33 to £41 or an amazing £16.50 to £20.50 per person per night, and this includes a stylishly presented breakfast of tea/filtered coffee, freshly squee zed juice and a continental meal. You can also enjoy a fabulous leisurely 3-course meal (visit our website for images) for an additional fee of £13 per person, many of our guests say that the meal they have at the riad is the best they have whilst in Marrakech. Please note: in keeping with cultural and religious sensitivities all food served at the riad is halal using local suppliers and we also do not serve alcohol. For a small charge of £13 (upto 3 people) we will also collect you from the airport and bring you straight to our riad in a modern comfortable vehicle, an option we very strongly advise our guests to take so that they can be orientated with the small streets and geography of Marrakech by our staff before venturing out to discover the city on their own. You can combine a stay at Dar Nour El Houda with direct flights from Ryanair or Easyjet from a range of UK airports with return flights starting from an amazing £58. For example, at the time of writing this (18 Ju ne 2015) you can book flights from London Stansted to Marrakech via the Ryanair website for £116 for 2 (£58 each) from 28 November to 1 December 2015 (Morocco being a winter sun desitination), combine this with 3 nights at our lovely Baraka or Sirr rooms for £57.60 for 3 nights per person (using code DAR20PCENT) creating an adventurous unforgettable break for just under £116 per person. Many other date combinations are possible from London, Manchester, Birmingham, Bristol and Glasgow. You can use websites such as www.skyscanner.net to search for flight combinations by month. If you are thinking of spending longer in Morocco, a stay at our riad makes an excellent retreat to just spend days relaxing in the different areas of the building. Marrakech also makes a great base for further travels, especially the nearby Atlas Mountains or the coastal town of Essaouira. All of these trips can be arranged for you at our riad. If you want to see visitors photos of our riad please see our TRIPADVISOR PAGE which also has many five star reviews from former guests. 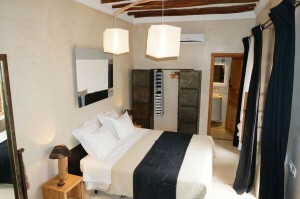 Please also explore our website for a lot more information and photos on our unique and beautiful guesthouse. CLICK HERE for the booking page and CLICK HERE for the homepage. 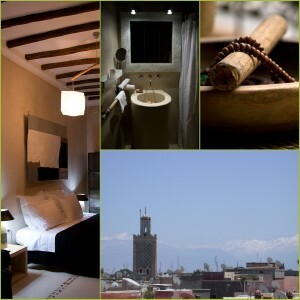 We look forward to welcoming you to Marrakech, may you have an excellent unforgettable visit! Note: prices do not include local taxes which are clearly stated at the booking stages and are a small daily charge required by the Moroccan government.